A lot of guitarists ask the question “do I need a pick to play guitar” or can I just use my fingers? But of course the answer is no! Of course you don’t need a pick to play guitar – you can play guitar without it. And in fact there are times when it is better to play without a pick – the obvious being when playing fingerstyle of course. Fingerstyle guitar is when you play the strings on your right hand by plucking the strings with your individual fingers and thumb as opposed to strumming or flat picking where you use a pick or one finger or thumb. Some people fingerpick with their fingernails and others with the pads of the finger. So, if I’m not playing fingerstyle why can’t I just use my nail or my thumb to strum and flat pick? Well you can – and in some cases you might even want to in order to get a certain desired sound. However, you definitely want to learn to play with a pick because there are certain sounds you can create with a pick and you can get a certain feel with a pick that you just can’t get out of your fingers. If you aren’t playing with a pick and only with your fingers then I definitely suggest learning to play with a pick. Of course you don’t always have to use it but there are often times when it just sounds better and more dynamic. The other reason why you should have “playing with a pick” in your repertoire is that you can extract more volume using a pick than you can with your fingers. Couldn’t I Just Learn to Play with my Fingers and Introduce a Pick Later? Absolutely that’s an option…. but it’s not the best option in my opinion. If you do it this way you become a lot more comfortable using your fingers and don’t feel natural using a pick. This will make it much more difficult using a pick later on and you may not be able to motivate yourself to play with a pick later if you know you can play better and more naturally without it. So if you are a beginner, learn to play both with and without a pick right from the outset. This will make it easier down the line and make you a more versatile player in the long run. Of course you can always pick up (pun intended) playing with a pick later on but it’s just a bit more effort doing it that way. Like with learning a language it’s a lot easier to do when you are first learning to talk than after you’ve already been speaking one language for a long time. What Type and Thickness of Pick Should I Use? If you aren’t already aware, picks come in different thicknesses. If you look closely at the image at the start of this post you’ll see that it has the thickness written on it. In the case of that pick it’s 0.46mm. There are a few different factors to consider when choosing the best pick for you. Check out the link below for a good discussion on pick material, thickness, shape and texture. Of course you can learn to play the guitar and never play with a pick. But I think you are limiting what you can do on the guitar if you do that and you could a much more versatile player and, with certain songs and certain techniques, you won’t be getting the most out of your guitar. The best time to learn is when you first start learning the guitar but it can be picked up later – it’s just a bit more effort. Thanks for reading. I hope this answers the question whether or not you should learn to play guitar with a pick. What do you think? Do you think picks are necessary? I’ve tried a few times to play the guitar. I never stuck with it though. Those times I did try, I used a pick. I think the pick is easier on the fingers. I’m guessing, those who play with their fingers build up a tolerance or maybe calluses. I do have a question though. For those who start with a pick, wouldn’t it be as difficult to transition to thumb as it is to transition from thumb to pick? As I said, I’m not a serious player, so I wouldn’t know. I think that you’re right that it would be just as hard to transition from playing with a pick to playing with your thumb or fingers – which is why you should learn both from the beginning. Yeah a pick can be easier on the fingers but like you say callouses do get built up. It kind of sounds stupid but I do have this question when I start learning the guitar. I don’t like having too many tools and wanted to just play with my fingers. So now I see that playing with and without a pick makes a difference. I have always been using my fingers all along. Are there different types of picks or are they just the same (technical-wise)? Thanks for your message. Yeah my brother just plays with his fingers and always has – me and my other brother have been trying to convince him for years to use a pick! There’s definitely different types of picks – and they work better for different things – I’m just finishing writing up a post about how to choose the best pick for different purposes. I’ll post the link to that here once published. 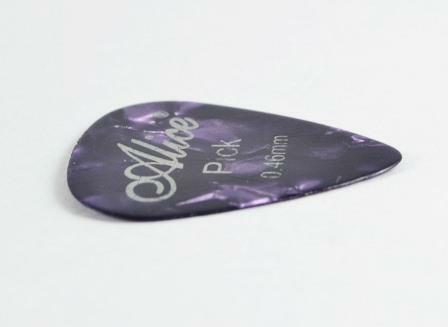 But just quickly – a thinner, more flexible pick is general good for acoustic guitar when used as an accompaniment – and is only really used for strumming. A more medium thickness is the most versatile and can be used for a bit of everything and thicker picks are typically for playing lead and usually used with electric guitars – but that’s a very quick summary – I’ll link to that other post when it’s done.